We are located in the heart of the city center, only few meters from the main square. Steps away from bars, restaurants, bus stops, supermarkets and local shops. You can't get more central. You can enjoy the scenery from every area of the house, including all bedrooms. We have dorms with 4 and 6 beds. As well 4 beautiful double rooms, three matrimonial and one with a twin option. All of the rooms are spacious and luminous! They have central heating and individual lockers. The large living room invites you to chill out on the comfortable couches after a long day of hiking. The size and the furnishing of the dining room make the perfect place for socializing with guests from all over the world. An eclectic selection of music helps to create the right atmosphere for each moment! We have a fully equipped large kitchen with utensils and basic ingredients (spices, salt, oil, tea, coffee, sugar), three big stoves and a microwave. The free breakfast includes fresh homemade bread, butter, homemade jam, dulce de leche, a healthy cereal mix, milk, coffee and tea. There is free internet access and Wi-Fi. You can’t miss sun bathing, having a drink, reading a book or just relaxing on the large balcony looking at the lake and the mountains. As the house is non-smoking there is a smoking gallery on the balcony. Other services: laundry and a small selection of drinks (wine, beer and soft drinks). TV and some movies are also available. 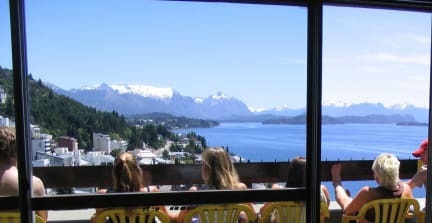 We have lots of information about things to do in Bariloche. - No check ins after 4 p.m. If you do arrive later than 4 p.m. we'll ask for a deposit of the balance due of the first night. - Check out time 10:00 a.m.
Epic views, cosy comfortable common areas. Staff were super friendly and helpful. The freshly made bread was wonderful and they had all the information you needed to get around. Loved it! Great location, fab views. Friendly staff. Nice rooms. Clean and secure. Highly recommend. Beautiful views, great location, plenty of showers and bathrooms to share, yummy homemade bread for breakfast. Also had laundry service for 200 pesos for a decent size bag which was washed, dried, and folded and given back to us which was much needed. Would definitely stay again! Loved this place. Awesome staff and great vibe. Amenities were nice and overall pretty clean. Great location and had an amazing view! 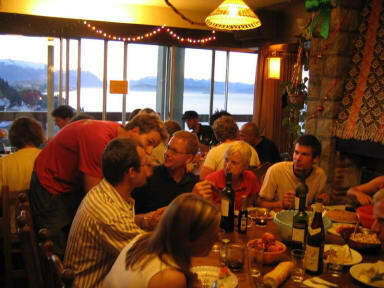 Amazing hostel in great location. Staff was very knowledgeable and friendly. Common area has incredible views, and is a great place to meet other travelers. The only two things I'd note is that the wifi is pretty bad (especially in the dorms) and there is a 1:30am 'curfew' where guests have to leave the common area. I was getting some work done on my laptop (alone) and politely asked to leave at 1:30. It felt a little strange as I was just working silently. We really enjoyed our time in this hostel. Staff were great and very helpful. Very central to everything and the bus stop at your door step. If you enjoy cooking in your hostel, this place is well equipped. I stayed here for 3 nights, my first night here I saw a bed bug on the wall by my bed and had bites on my neck. Informed staff and was moved to another room for the other 2 nights. Didn’t get any more bites so I’m assuming it was just that one bed that had bed bugs. The rooms are dated, bathrooms clean, good showers, free breakfast is minimal- basically just bread. The WiFi was touch and go and didn’t work in the rooms. The view is fantastic off the lounge area, laundry smelled nice. Great hostel. Great view. Very helpful staff. Good breakfast nice rooms. Not too many bathrooms but overall good stay. Nice lounge!